today i am feeling happy and dare i say, excited. I am not as sick as they told me i might feel by today, the kids are at a retreat so Blake and I get a weekend alone, we are even having a couple of friends over for dinner and to watch march madness-life feels “normal” today. 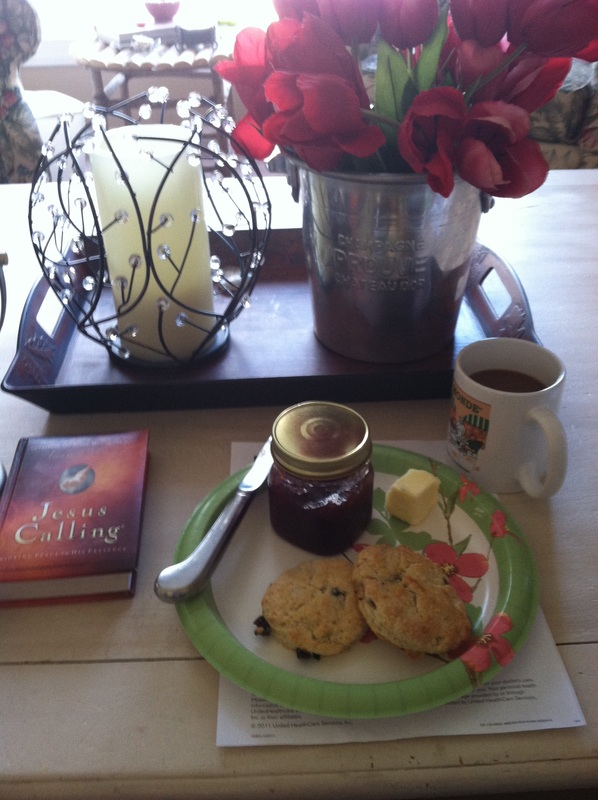 Oh-and i am eating scones my mom made for us yesterday and I can eat them guilt free. I am trying to look on the bright side of my situation: i lost 15 lbs in the hospital so for the first time in about 20 yrs i can eat whatever i want without considering calories and fat. Also, putting on a wig takes me 30 seconds vs 45 minutes to do my previous head of hair….think about it ladies. I can loan you my wigs any time you are fed up with that nonsense. grateful for another day of health and feeling good. also-just an example of how God cares about the tiniest details of our hearts: friday i had decided that even though I should probably use a gift card for our dinner saturday ( since you are all so generous), that i was going to go wild and order Magic Kitchen while I still feel like eating and am not sick. Friday night my friend Jenn brought a gift card to the house for our dinner and as you might guess…it was for none other than MAGIC KITCHEN!!! God is funny and reminds me that he is in my Leukemia journey down to the simplest pleasures. Heather, I love the blog and your wig. I pray for you daily and know God is in this. We miss you and Blake. I hope he is being blessed richly in whatever work he is doing. You both are special to me. So HAPPY! 😉 you are doing well! My thoughts, prayers and love to you………….. So glad you’re having a good weekend! II also especially like your lovely candle!!! Love and hugs!